The Laughing Owl was named for its call; a loud and doleful “cack cack cack” described as sounding like the laugh of a mad man or a small dog’s bark. 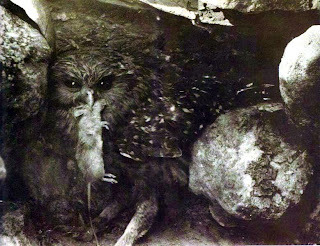 This owl was last confirmed alive in the wild in 1914 but it may have persisted until the 1930s. Also known as the “Hahoke”, “Whekau”, and “Ruru Whenua”, it was unique to New Zealand. 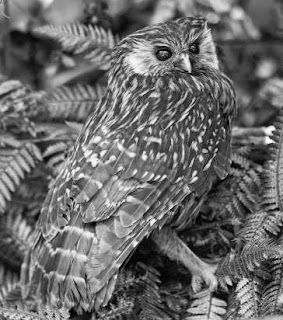 Laughing Owls were widely distributed across New Zealand from North Island to Stewart Island. They inhabited rocky, low-rainfall areas as well as woodlands and forest. There were two subspecies found on North Island and South Island respectively, the North Island Laughing Owl (S. a. rufifacies) and the South Island Laughing Owl (S. a. albifacies). The North Island subspecies was slightly smaller than its South Island counterpart. The Laughing Owl’s plumage was dark brown with yellowish-brown or white striations. The facial-disc was gray around the eyes and lightened to white toward the edges. Some birds could be more of a reddish color with a brown facial disc. They had a very stumpy tail. 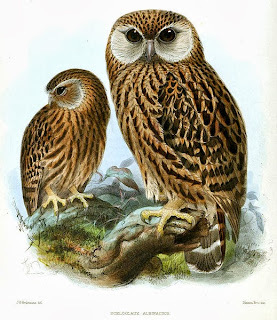 They grew to be twice the size of the Morepork Owl (Ninox novaeseelandiae), New Zealand’s other native owl, measuring 35.5 to 40cm (14 to 15.7in) long with a 26.4cm (10.4in) wingspan, and weighing up to 600g (1.3lbs). Females were slightly larger than the males. The diet of the Laughing Owl is well-known thanks to animal remains found at old nest sites. We know that they fed on a great diversity of prey species and that they would adapt their diet to whatever small animals where in the region in which they lived. Just one nesting site contained the remains of 41 prey species; 28 birds, 1 tuatara, 3 frogs, at least 4 geckos, 1 skink, 2 bats, and 2 fish. Sea birds such as prions were taken where the owls nested near their colonies on the coast. Inland specimens commonly hunted kiwis, native ducks, tuatara and even large earthworms. When humans arrived to New Zealand, they began to take advantage of introduced mammalian prey such as rats and later, with the arrival of Europeans, mice and rabbits. These owls were powerful predators that hunted on the ground instead of from the sky as other owls do; chasing prey on foot or stalking and pouncing on it feet-first, then carrying it to their nest. They are known to have nested in cavities in limestone buffs, fissures, rocky ledges, under boulders, or on bare ground. Nests were lined with dried grass. Breeding season for this species was from September to October, after which the females would lay one or two eggs. Incubation lasted 25 days, during which time the female took sole nest duty while the male brought food back to the nest. Laughing Owls were still abundant when European settlers arrived to New Zealand and quickly adapted to hunt the small mammals they brought with them. However, by 1880 they were noticeably becoming rarer. The last recorded wild specimen was found dead in Canterbury, New Zealand on July 5, 1914 and there were further unconfirmed sightings during the 1920s. Their decline is attributed to the competition and nest predation of introduced weasels and cats. Relatively unaggressive, they are known to have adjusted well to life in captivity and were easily bred. Sadly, no effort was ever made to establish a captive population. Despite this, multiple encounters with unidentified birds have been surfacing ever since the Laughing Owl’s supposed extinction. Witnesses describe seeing or hearing birds emitting a cry that sounds like maniacal laughter, opening up the possibility that remnant populations of this owl still exist.